Today only: 50 cent deliveries for all 50 states! For all those who are having problems with the fifty sense coupon code. Create an account, add items to your cart. Wait 15-20 minutes and you will receive an email which gives you 30 days waived delivery fee for only $1. Offers for one-month $0 or $1 delivery fees are valid for 30 days after customer’s first order is delivered. And seems like you have to activate the email for the $1 promo delivery. First-time users only. Offer valid for 30 days after customer’s first purchase. Only applicable to orders with a minimum subtotal of $10 or above. Limit one per person. Other fees, taxes, and gratuity still apply. All deliveries subject to availability. 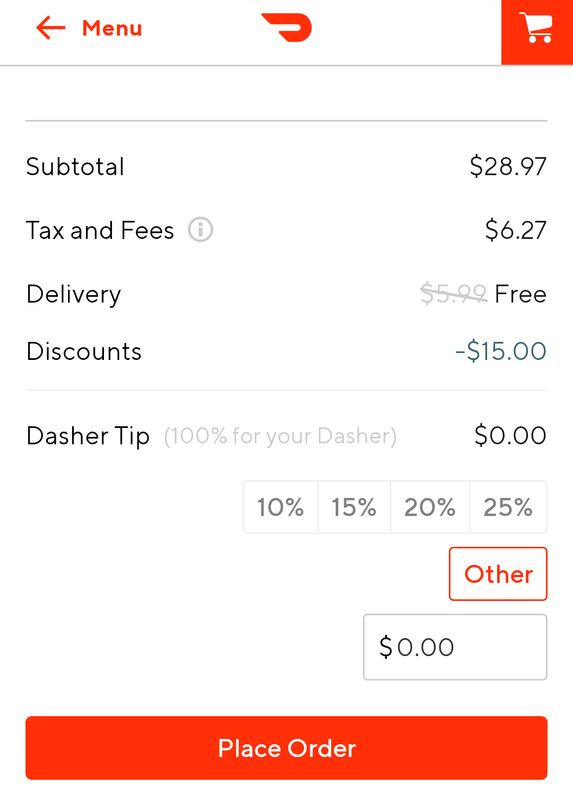 Must have or create a valid DoorDash account with a valid form of accepted payment on file. No cash value. Non-transferable. Non-transferable. See full terms and conditions at http://drd.sh/rtb7p2/. Click on help in your order history. i wonder i place an order and then cancel it right away will that activate the free shipping for $1? Check your inbox for a $15 offer and free shipping.